White tea is a slightly fermented tea with its body covered with fluffy white hair. The general processing for Chinese white tea only includes two steps: withering and drying. White tea brews to a pale yellow/light red color, and has a slightly sweet flavor with no "grassy" undertones which sometimes associated with green tea. Recent health research results have pointed to Chinese white tea as potentially having the largest amount of health benefits of any of the Chinese teas made from Camellia sinensis. The most popular Chinese white teas: silver tip white tea and white peony tea. The producing method for longevity eyebrow is similar to that for white peony tea. The difference between them is the material.White peony tea uses one bud with 1-2 leaf as material, while longevity eyebrow uses one bud with 3-4 leaf as material. Since the bud of the tea is slim and curl like eyebrow, so called longevity eyebrow. Fujian new white tea is a white tea made by new producing craft.Fujian New white tea doesn't request tender tea leaves like white peony tea or longevity eyebrow. The processing of FUjian New white tea include three steps: withering, slightly rolling, and drying. The withered fresh tea leaves shall be slightly twisted immediately then dired. (1) Big white: the white tea made from fresh tea leaves plucked from "Big White Tea" variety. (2)Narcissus White: white tea made from fresh tea leaves plucked from "narcissus white" variety. 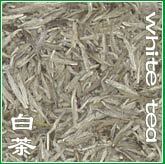 (3)vegetable white:white tea made from fresh tea leaves plucked from "vegetable white" variety. Silver tip white tea (or silver needle pekoe) made from single buds plucked from "Big White Tea" variety. White peony tea made from one bud with two/three leaves plucked from "Big White Tea" variety or Narcissus White. The history of white tea manufacturing is shorter than other tea types. As recorded, white tea was firstly created in Fuding county in 1796. In that time, the farmers plucked the fresh tea leaves from "vegetable white" variety to make silver tip white tea. And, the "Big White Tea" variety was found in Fuding about in 1857. Since 1885, the farmers began to pluck fresh tea leaves from "Big White Tea" variety to make silver tip white tea, which called Big white in that time. And, the silver tip white tea from "vegetable white" variety then so called "unrefined neelde" or "small white". The "Big white" variety was also found in Zhenghe in 1880. The tea farmes began to produce silver tip white tea in 1889. Till 1922, white peony tea was then produced there. White peony tea was firstly created in Shuijie( Jianyang county nowadays). While, it's not sured when white peony tea was created. The white tea production began from Fuding, then spread to ShuiJie, then Zhenghe. As to white tea products, silver tip white tea was firstly creasted, then white poeny tea, then longevity eyebrow. The export business for silver tip white tea began from 1891. Since 1910, Chinese white tea tend to be popular in Europe and America like Chinese congou black tea. White tea is one of our main products.It play an important role in our business line.We offer certified organic white tea and flavored white teas, such as mint flavor,vanilla flavor, lemon flavor, apple flavor ......etc. We not only offer full leaf premium white tea, but white tea teabags. We'd like to cooperate with customers to develop new white tea products.